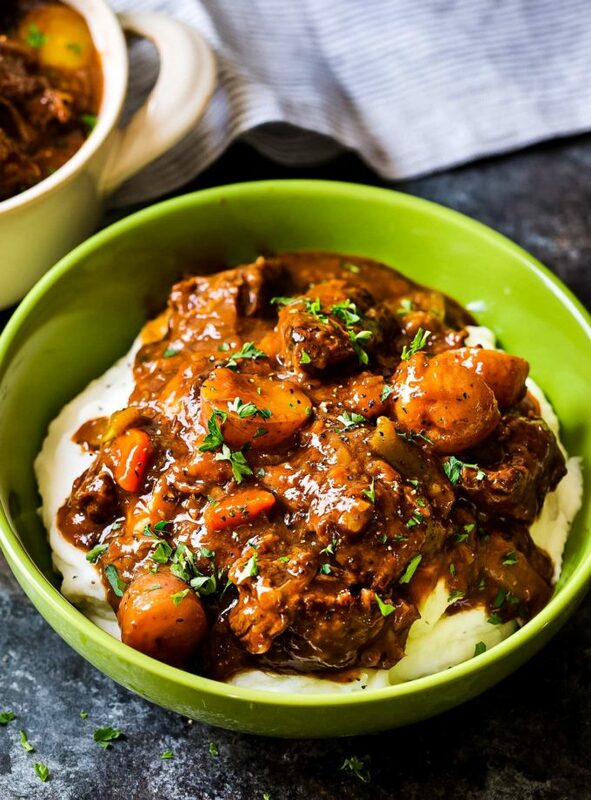 Rich Irish beef stew, made with the unmistakable flavor of Guinness and coffee, makes this the most savory and mouthwatering comfort food you’ll ever eat! There are few things more hearty and comforting than a big pot of rich beef stew. However, this Irish beef stew with Guinness beer and coffee really takes the cake! 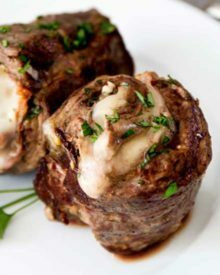 The Guinness and coffee flavors meld perfectly to give way to a deep, rich, lusciously savory sauce that simmers away to tenderize the beef so it’s practically spoonable! It may be starting to warm up, but I’m still all about that comfort food! I think one of the most quintessential comfort foods is beef stew, or in this case, Irish beef stew. Around this time of year, Guinness recipes start popping up all over the place. Not that I could really complain, I do love using beer in recipes, like my Guinness Cupcakes with Baileys Frosting, and Whiskey Glazed Blue Cheese Burgers. Irish beef stew is traditionally made with Guinness, but I really wanted to bring that rich flavor home, so I added some coffee extract as well. It mimics the coffee/chocolate back-notes of the beer, lending an amazing richness to the sauce. If you can’t find coffee extract, you can totally swap it out for about 1/4 cup of brewed coffee (and omit the 1/4 cup of water in the recipe). You’ll notice I said “sauce”, not “broth”. I like my beef stew to have a thicker, loose-gravy consistency. After all, a stew should be thick and hearty right? I think the picture above shows how glossy and thick it is. One of my favorite things about this Irish beef stew, is that while it’s amazing right away, the leftovers the next day are even better! The flavors have really had time to blend together, and it reheats beautifully! IS THIS A TRADITIONAL IRISH STEW? No it’s a American-ized adaptation. Here in the US, around St. Patrick’s Day, a traditional meal is a Guinness Beef Stew. An Irish stew is made with mutton and is more of a brothy consistency. I prefer my stews to be thicker and full of deep, robust flavor! Even though this stew has some potatoes in it, sometimes I like to be a bit extra decadent and serve this stew over a pile of mashed potatoes! If you’ve never had it this way, you simply have to try it!! DO YOU COOK BEEF STEW COVERED OR UNCOVERED? I’ve always cooked mine covered as it simmers, since it holds in all the heat. At the end of cooking, remove the lid and let some liquid evaporate as it simmers, which thickens the stew and concentrates the flavors. WHAT GOES IN A GUINNESS BEEF STEW? 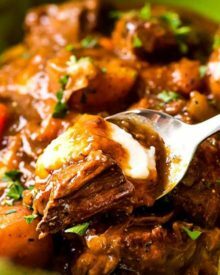 Generally a Guinness beef stew is made with a tough cut of meat like a chuck roast (or shoulder roast), vegetables (like potatoes, carrots, celery, parsnips, mushrooms, etc), chicken/beef broth, tomato paste, plenty of seasoning, and of course, the Guinness beer! My version uses a bit of coffee (or coffee extract) to deepen the flavors, and some prunes. The prunes help mitigate any possible bitterness from the beer. In case your stew doesn’t thicken up the way you’d like, there are three main ways to thicken up a beef stew. The first two involve making a slurry – which is basically adding flour or cornstarch to a cold or room temperature liquid. And don’t forget to round out this Irish feast with some no bake Baileys brownie batter dip or Boozy Baileys Oreo Milkshakes for dessert! Use sturdy potatoes. I love to use baby Yukon gold potatoes. 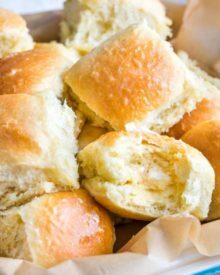 They’re so buttery, yet they are sturdy and hold up well to a long cooking time. Plus, there’s no need to peel them, just halve or quarter them after washing. The prunes are optional, but I highly recommend them. Both the Guinness and the coffee can be a bit bitter, and the prunes really help alleviate that. Cozy on up with a big bowl of this Guinness and Coffee Irish Beef Stew and treat yourself! 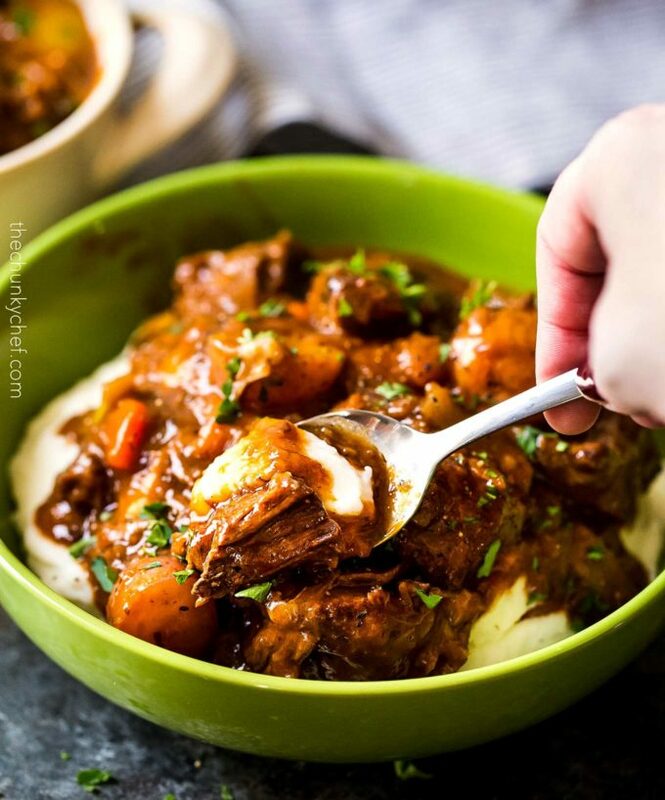 Rich Irish beef stew, made with the unmistakable flavor of Guinness and coffee, makes this the most savory and mouthwatering comfort food you'll ever eat! Use a sharp knife to slice beef chuck into 1 1/2-2" pieces. Pat beef with a paper towel to dry, then season liberally with salt and black pepper. Heat olive oil in a heavy bottomed pot (I love to use my dutch oven) over HIGH heat. Complete steps 1-4, add Guinness and loosen any browned bits from the bottom of the pot. Transfer mixture to a slow cooker. Add remaining ingredients and cook on LOW for 8 hours. Complete steps 1-6. Cover and bake at 325 degrees F for 2 hours 20 minutes. Remove from oven, add potatoes and prunes, and simmer uncovered on the stovetop as directed in the recipe for 30-40 minutes to reduce sauce. Season meat according to step 1, then heat oil in Instant Pot on the "sauté" function. When hot, add beef. To get a good sear, do 2 batches and brown each batch for about 5 minutes total. Remove meat to a plate. Add the onions and sauté them for 2-3 minutes. Add the Guinness and use a wooden spoon to scrape up any brown bits into the sauce. Add tomato paste, chicken stock, carrots, celery, parsnip, bay leaves, thyme and coffee extract mixture to the Instant Pot. Add the meat back to the pot. Close the lid and make sure the valve is on "sealing". Cook on high pressure for 35 minutes. Let pressure release naturally for 10 minutes or so, then do a controlled quick release to get rid of any remaining pressure. Thank you for the recipe. My wife and son asked for Guinness stew for St. Patrick’s Day dinner. -A good hearty beef stew. I followed the recipe except I used 1/4 cup of strait espresso and added some extra parsnips and potatoes to increase the leftovers. Used a dutch oven and cooked it in a 300F oven for 2 hours before finishing. It was still a bit bitter (could have used either more prunes or less coffee) and the beef (I used a bottom round cut) wasn’t-melt-in-your-mouth, so I should have gone for 2.5-3 hours in the oven (which I do for Carbonade Flamade, which is almost the same recipe but with two bottles of Belgian double ale and no coffee). Made this stew yesterday and it was delish! Thanks for the bold robust complex layers of flavor in this one! Got to use my dutch oven and all the wonderful ingredients in this recipe. I used a Modern Times Black House coffee stout and it turned out wonderful! 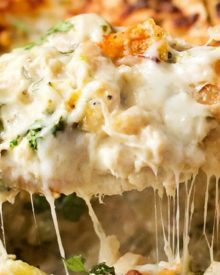 I made this recipe yesterday for our community St. Patty’s Day party last night and OMG it was absolutely delicious! Thick and so full of flavor, it was a huge success. I wish I knew how to share the photo I took of my crock pot at the end of dinner. It was basically scraped clean! I don’t know if this made a difference, but due to time constraints, I did the prep work and simmered for about 45 minutes on Friday then refrigerated overnight. Saturday morning I put it in the oven for about 2 1/2 hours. Back on the stove with potatoes for a long slow simmer. This was the best stew I’ve ever had! Happy Sunday & St. Paddy’s! Made it and it’s a delicious recipe I will definitely make again! What do you think about substituting the prunes with raisins? I haven’t tested it, but I think that would work out okay. Hi, it looks delicious and I am going to make it for our family’s holiday party this Sunday. mmm..this looks SO hearty and delicious!! 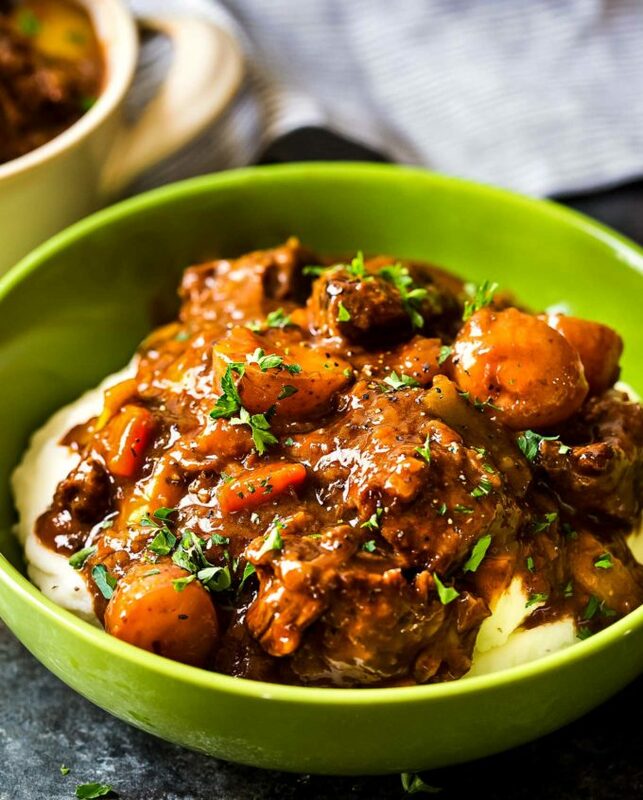 Love your take on Guinness stew! Looks mouthwatering and satisfying to boot! Can’t wait to try this out this St. Patrick’s Day! My family loves beef stew so I am going to have to try this recipe. My mouth is watering just thinking about it. Yummy!!! I’m going to make this for the weekend! It sounds delicious! Making this now. When browning the bacon, was I supposed to remove the onions and garlic prior to adding the bacon. The recipe doesn’t indicate so and no one else has asked the question. The bacon doesn’t seem to be browning and it’s been in my Dutch oven for a while now. No one has coffee extract as I’ve gone to 3 grocers 😰 Would this work? 6.5 ounce can of Starbucks Doubleshot Espresso? I’m not a huge coffee drinker, 1 cup a day lol! so I’ve no clue. Merci! I would use approximately 3 Tbsp of the espresso. & 2 teaspoons warm filtered water. Mix water and instant coffee until all coffee granules have dissolved. I made this last night and it is soooo goood! The meat is super tender and the flavors awesome. I am curious to as to the recipe calling for chicken stock instead of beef stock. I think the next time I make it, I’m gonna use the beef stock. And there will be a next time! I’m in the process of getting the ingredients together and looking forward to making this recipe. All I can find is Guiness Draught stout with Nitro. They say the nitro makes it smoother. Is this what I should be using? Hands down the the best stew I ever made and everyone loved it! I found a coffee extract at WalMart called “Watkins Pure Coffee Extract” at a lot less the cost of the Nielsen Massey and it worked fine. Thank you!! This is seriously the best beef stew recipe that I have ever made, and quite possibly one of the best ones that I have ever eaten. Made it exactly as written (used strong espresso instead of coffee extract though, since I couldn’t find the extract) and it was fantastic. Thank you! This looks amazing! Anything I can use instead of beer though? Hi Rachel 🙂 Unfortunately Guinness is a pretty distinct beer and it lends a definite flavor to the dish… so yes, you can substitute, but the flavors won’t be quite the same. I haven’t tried this, so I can’t guarantee the results, but I would try 10 oz of beef stock or broth and 5 oz of coffee to replace the beer. This stew was simply amazing! I could not find coffe extract locally, so I ended up making a substitute with instant coffee. This recipe is a definite keeper! Oh my gosh! I hope you see this soon Amanda. I’m making the recipe but I accidentally bought pitted dates instead of dried prunes. Will they work??? Please help! Eee-gads! Hi Nancy 🙂 Instead of the extract, you can use 1/4 cup of strong brewed coffee (just omit the 1/4 cup of water from the recipe). 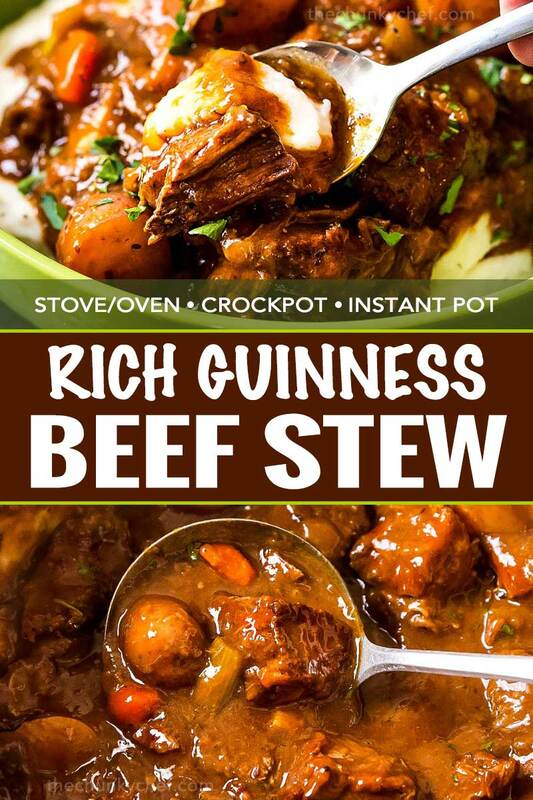 I always use a can of Guinness Draught… stout has a much stronger taste and could make this stew bitter. Yes, in the recipe itself, towards the bottom there’s a recipe notes section… and there’s crockpot/slow cooker instructions there. I’ve never marinated anything for this recipe, as it’s plenty flavorful as written, and I think if you use the beer/stock to marinate, you won’t have the correct proportions of liquid since some of the liquid will be absorbed into the meat. Hope you love it! 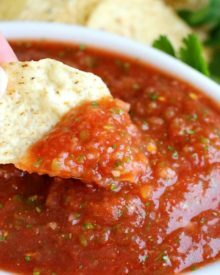 Hi, I’m looking to triple this recipe (for 15-20 peso please). Any advice would be welcome. Especially concerning the amount of liquids (beer) or cooking times. Hi Courtney, I’ve never tripled this recipe, so I can’t say for certain… but you’ll have to have a huge pot, or two large ones and split it between the two. In order for the flavor to be the same, you’ll have to triple all of the ingredients, including the beer, otherwise it will be a lot less flavorful. 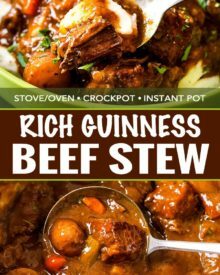 Great quick and easy recipe, just remember folks that Guinness stew only gets better tasting the next day when it’s sat in the fridge. Hi Maggie 🙂 The oil should work just fine… and I got the fork from this shop https://shopmilkandhoneyluxuries.com/products/yum-fork-hand-stamped-silverware-for-desserts-and-treats . They have such amazing things… personalized silverware, cutting boards, you name it! 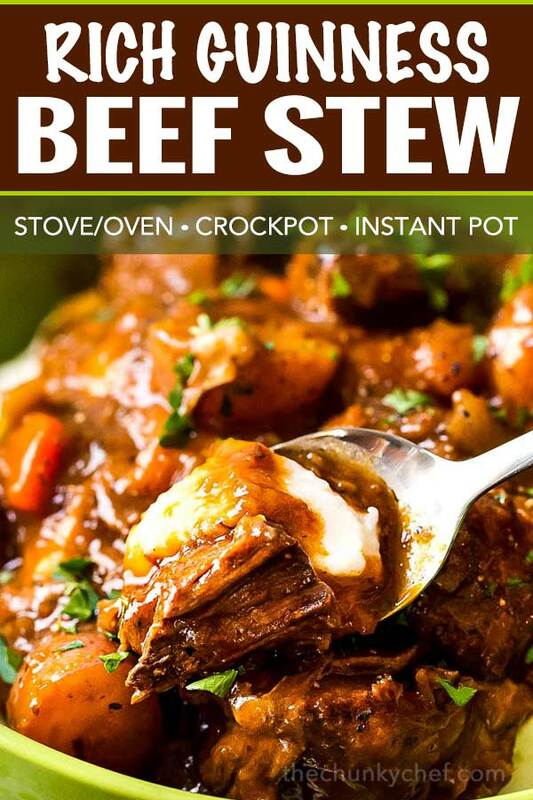 I want to make this in the slow cooker tonight but mistakenly brought Vegetable stock instead of Chicken stock, and Murphy’s draught instead of Guinness…..Can these be used in place of and still taste good? Being low in carb, I’m so excited to try it out! i am making this on Sunday when I come home. How bitter is it without the prunes? If not, is there anything i can replace the prunes with? Hi Catalina 🙂 It’s hard to say, since people have such different tastes. If you like the flavor of Guinness, then I’d go ahead and leave out the prunes. I’d say a good substitute would be a Tbsp of brown sugar or some pureed carrots. 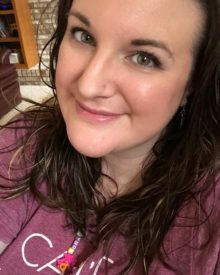 Amanda, thanks for sharing another awesome recipe as always! Been a long time reader and I found all your recipes wonderful. Tried a few of them as well but not as deliciously looking like yours. Keep up the great work! Am so excited to make this recipe. Can you substitute espresso powder for the coffee extract? I plan on making it this week. Thanks for the recipe. Hi Bruce 🙂 I’ve never done it, but I think if you dissolve the espresso powder into the 1/4 cup of hot water it should work just fine 🙂 Hope you love it!! 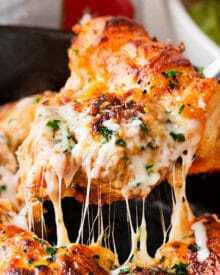 Thinking of making this for dinner tonight. Just curious, why do you use chicken stock instead of beef stock ? OMG! It looks fantastic!!! Will definitely try it! The coffee extract is a brilliant idea! Coffee flavors are great in stout, so why not in a stew with beer? I think I can smell this delicious Guinness Coffee Irish Beef Stew! 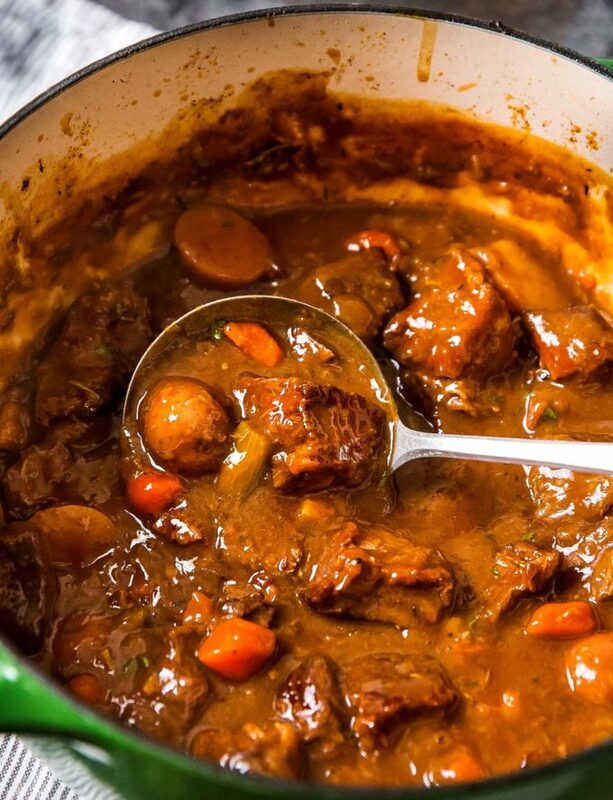 This stew is astonishingly gorgeous – your photos are amazing! I love both my beer and my coffee dark, dark, dark – so the deep, rich flavors in this stew sound fantastic! Nielsen Massey makes such great stuff, and it’s just brilliant to use their coffee extract here to deepen those dark, rich flavors from the Guinness. 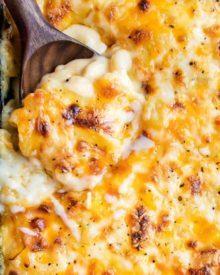 This is serious comfort food any ol’ cold evening, but absolutely spot-on perfect for St. Patrick’s Day! This has me drooling — it looks so rich and flavorful! I bet it smells amazing as it cooks, too! Great pix by your daughter! This is the first Beef Stew recipe I have EVER wanted to make. It’ll sure chase the winter blues away here in southwestern Idaho. Guinness and NM Coffee Extract???? Shut-the-door-n-your-way-out good combination. This is such an interesting recipe, Amanda. I love my Baileys in the weekend evenings, and I love my daily moca brewed coffee. 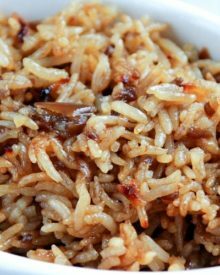 I’m also on a low-carb diet, so this is recipe is perfect. I just love a comforting beef stew. I’m totally intrigued with the addition of Guiness and want to make this for St. Paddy’s day!!! These flavors sound so gorgeous! I need some of this!